Central Otago is the southernmost vineyard area of the world, lying on the 45th parallel. In the northern hemisphere, the 45th parallel runs through the southern Rhône and Oregon’s Willamette Valley, whereas in the southern hemisphere, only the sheep farms of Southland separate it from the cold reaches of Antarctica. It has some of the most dramatic and beautiful vineyard scenery that I have ever seen. Rippon Vineyard on lake Wanaka, with the snowcapped backdrop of the Southern Alps, must be one of the most photographed vineyards in the world.It had been seven years since I last visited Central Otago, and the progress in that time has been enormous. In 1995 there were four wineries; now there are some forty-five licenced wine producers, some with their own wineries, some planning wineries, and others using the wine-making facilities of the Central Otago Wine Co. In an amazingly few number of years, Central Otago has established a global reputation for Pinot Noir, as witnessed by the Pinot Noir celebration which took place in Queenstown in February this year. Rolfe Mills was the very first to plant vines at Rippon back in 1976. He was followed by Alan Brady at Gibbston Valley, who remembers how the sceptics said it was “too cold, too high, far too south, and in any case what did an Irish journalist know about making wine? ” “Absolutely nothing” was the answer to the last question, illustrating the attitude of the early pioneers which was very much “plant and to hell with it!” Then from the early 1990s things became more professional, as the existing wineries gained experience, and the newcomers – grape growers and investors alike – took a more serious and commercial approach. John Olsen of Olsens of Bannockburn explained how he commissioned a MAFF land survey, which identified various sites in Central Otago that would be suitable for grape growing. They looked at soil and climate, for an altitude of less than 400 metres, with a slope of less than 15E, and an aspect going from NW to NE. Originally this land had been used for sheep farming. Alan Brady remembers that when he first came to the Gibbston Valley, there were six high country sheep stations, ranging between 6000 and 40,000 acres. And John Olsen finally bought a plot of dry barren land, which has been used for grazing a few sheep for a few weeks of the year. With the visible success of the vineyards, land prices have inevitably escalated. Twenty years ago you could have bought 20 acres for 20,000 AUS; nowadays you will pay that for a single acre. There are people who want to invest in the industry without being involved in the physical aspects of grape growing and wine-making. For these people, Wentworth Estates with Peregrine, one of the new proudcers, have set up a scheme whereby investors buy a tract of land, on which they can build a house, with vineyards that are planted and managed for them by Peregrine. Their investors include professional people from all walks of life: some local; some from other parts of the country. There are also New Zealanders living abroad and foreign incomers. There are also rumours of various American investors, some already in the wine industry in California or Oregon. Central Otago is the one region of New Zealand with a continental climate, meaning hot summer and cold winters. All the other main vineyard areas are on the coasts of the North or South Islands, and influenced by sea breezes. Gradually four broad sub-regions have been identified, namely the Gibbston Valley to the east of Queenstown, Bannockburn which includes the vineyards around the old mining town of Cromwell and the artificial lake Dunstan, Wanaka, and warmer Alexandra. There are vast tracts of vineyards along the road to Wanaka from Cromwell which have yet to come into production, to the extent that over half the Pinot Nor vines in Central Otago have as yet to yield their first crop. This is a sobering thought. Who is going to drink all this wine? There are two ways of looking at it: New Zealand wine production is a tiny part, just 2 per cent of world production, and although Central Otago is the fastest growing New Zealand wine region, it is still very small compared with Marlborough. So the new production will be just a small drop of wine in the world scheme of things. On the other hand are consumers prepared to pay £15 – £20 for wines that have little track record? The market for New Zealand Pinot Noir, and Central Otago Pinot Noir in particular, may well be limited. Some of the people behind the new plantings have looked at the export market and have a marketing plan, while others do not. And they cannot depend on cellar door sales and the domestic market alone. However there is no doubt that New Zealand provides some of the most satisfying Pinot Noir outside Burgundy, and that Central Otago is contributing to that success, as witnessed by a tasting of the 2000 vintage at the Pinot Noir celebration. Compared to other regions, maybe the wines of Central Otago have a purity of fruit and a freshness of acidity. Nor does Central Otago mean Pinot Noir alone. Akarua, a winery established by Sir Clifford Skeggs, a former mayor of Dunedin: quite firm spicy nose, with smoke overtones, repeated on the palate, with fresh acidity and fruit. Black Ridge Vineyard, one of the pioneers of the region, set up by Verdun Burgess and Sue Edwards back in 1981. Quite warm ripe fruit, rounded and quite a gutsy full-bodied style. Carrick, masterminded by Steve and Barbara Green with a couple of other partners, and currently building a winery which they hope will be ready in time for the 2002 vintage. This represents a career change for Steve, who was in local government. Light nose, elegant rounded fruit with a firm backbone. Chard Farm, another of the early pioneers, run by Rob Hay since 1987, who aims to make what he called seamless wine. And certainly his 2000 Pinot Noir was wonderfully harmonious and complete, without having a great deal of body. Felton Road, a relative newcomer which has created an international reputation in just a few years, thanks in part on their talented winemaker Blair Walter. Good colour; quite ripe dense nose, with ripe fruit, good concentration and silky tannins. Gibbston Valley Wines, another pioneer, with a cellar or cave dug out of the hillside. Some sweet ripe fruit, with layers of flavour on the palate, quite plummy. Mount Difficulty, now one of the largest Central Otago wineries, with vineyards controlled by Robin and Matt Dicey with other partners. Quite firm tight nose, with fresh ripe fruit; balanced and structured. Mount Edward, Alan Brady’s “retirement project” and own tiny winery. Spicy fruit, ripe, rounded and elegant. Olsen’s of Bannockburn, set up by John Olsen some ten years ago. Medium colour, light nose, raspberry fruit and acidity. Peregrine, Masterminded by Greg Hay, with a professional approach to the investment possibilities. Ripe fruit on the nose, rounded, attractive palate, with firm tannins and layers of flavour. Quartz Reef, Austrian born Rudi Bauer was one of the pioneer winemakers in Central Otago, and is now in partnership with Clotilde Chauvet, whose family own a Champagne house. Stylish Pinot Noir, with firm dry raspberry fruit on the nose and an elegant ripeness on the palate. 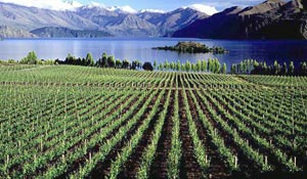 Rippon Vineyard, Another pioneer on the shores of lake Wanaka. Quite deep colour, with firm nose, lovely ripe supple fruit balanced with firm tannins on the palate. Two Paddocks, owned by cinema actor Sam Neill, with the wines made for him by Dean Shaw of the Central Otago Wine Co. Cherry fruit on the nose, quite ripe rounded palate, with some fresh acidity.